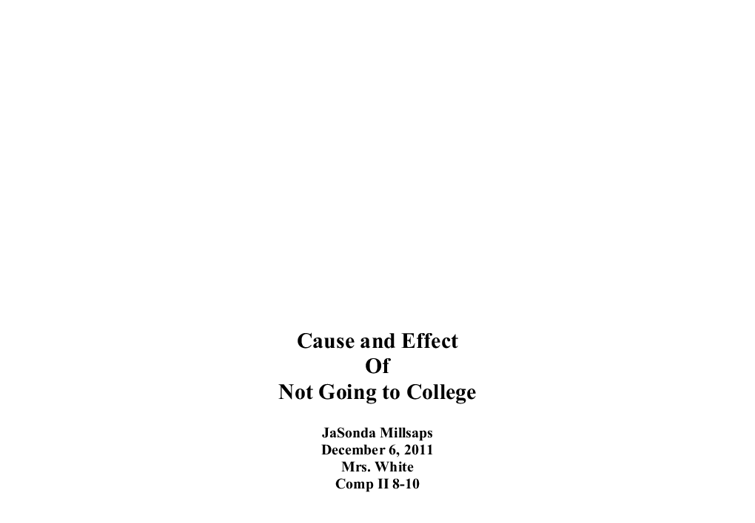 Cause and Effect Of Not Going to College JaSonda Millsaps December 6, 2011 Mrs. White Comp II 8-10 JaSonda Millsaps December 6, 2011 Mrs. White Comp II 8-10 Cause and Effect of Not Going to College There are many factors that will affect a person's life. Growing up in today's society, some people believe college is not important. College is an essential part of life. There are many reasons why some people do not attend college. What they see in society and how they grew up are amongst the many reasons of not going to college. One cause of not going to college is society. Your surroundings can cause a huge difference on how you view life. ...read more. Another cause of not going to college is how you grow up. Everyone does not grow up alike. Some parents have never been to college. Some households don't have the finances to attend college. Also the child probably doesn't like school at all. When a parent has never been to college, and the child sees or knows this, they believe they don't have to go either. They also wonder why they should have to if their parents didn't go. Next, not having the funds; money, scholarships, or financial aid, is an effect of how someone grows up. Last, because someone didn't like college, they just dropped out. Usually it begins before they even get to college. ...read more. What they see in society and how they grew up are amongst the many reasons of not going to college. I. One cause of not going to college is society. A. Surroundings II. The effects of your society can either break you or build you up. A. Society III. Another cause of not going to college is how you grow up. A. Growing up IV. When a parent has never been to college, and the child sees or knows this, they believe they don't have to go either. A. Parents There are many other factors that will affect a person's life. But not going to college is one main effect. Society and how someone grew up are two of many causes of not going. Think about how not attending college can affect you before you decide not to go. ...read more.